A post today that was supposed to go up yesterday, but I was having such a bad day I pretty much gave up, so apologies to Stuart Cowley and Tony Kulik for neglecting this post with more rumination on the fascinating subject of Hilton Hall. Stuart is of course, he lovely chap who wrote beautifully about his childhood at Chasewater, local marching band culture and history, his involvement in the golden days of local radio and he also shared a wonderful local history book for Chasetown. Following Stuart’s article, long term reader and friend of the blog Tony Kulik got in touch with a lovely gallery of photos from Hilton Hall which I feature at the top of this post. The glass domed building was the ‘orangery’ – it was derelict when we were kids in the 60’s and camped there with the scouts – it had an raised slab in the centre that the druids used as a sacrificial altar (or so we told to frighten us to death as we camped just 20 yards away from it in woods that have now been cleared). Thanks to both lads for lighting up a lovely bit of local history I for one was never more than peripherally aware of the existence of. The last article proved surprisingly popular, and if you have anything to add, please feel free: comment here or mail in – BrownhillsBob at Googlemail dot com. Cheers. 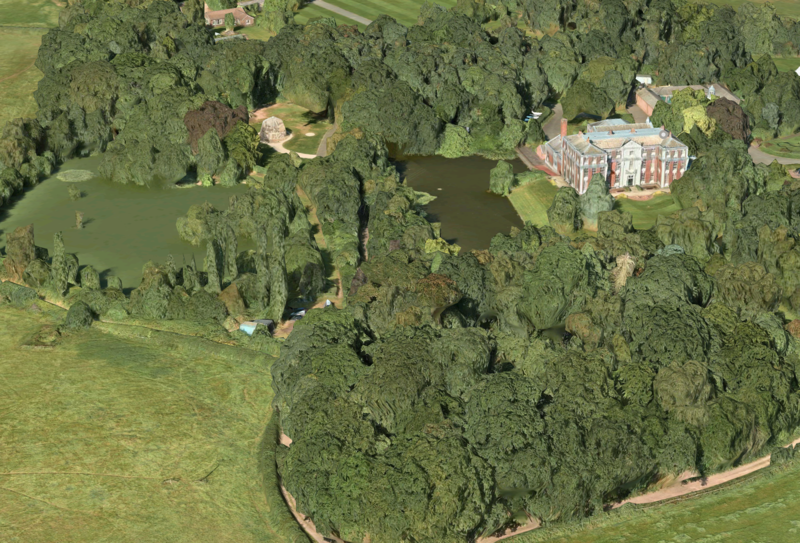 Hilton Hall as depicted on Apple Maps. Note the folly on the left. Click for a larger version. The Portobello Tower – image Kindly supplied by Stuart Cowley. Description:The Portobello Tower is a hexagonal, embattled tower built to commemorate Admiral Vernon’s capture of Portobello in 1739. It was perhaps designed by Rochard Trubshaw of Little Haywood and built between 1739 and 1765. Hilton Park passed to the Vernon family in 1547. The present hall was built for Henry Vernon in the early 18th century. The Vernons sold the hall around 1951 and for a while it was owned by a Catholic Order of Nuns. The Hall was the head office of Tarmac between 1985 and 1999. I was curious to find out more about Richard Trubshaw (above has him as Rochard, I think that may be an error) with him being a relatively local chap from Little Haywood so started a search on the net. Turns out that the Trubshaw family over the generations have helped to provide this area and beyond with some of our well known landmarks. I don’t know how this has passed me by until now. James Trubshawb (13 February 1777 – 28 October 1853) was an English builder, architect and civil engineer.His civil engineering works include the construction of the Grosvenor Bridge in Chester, Cheshire, then the longest stone span. He also pioneered the technique of underexcavation with the straightening the leaning tower of St Chad’s in Wybunbury, Cheshire. He was born to stonemason, builder and engineering contractor, James Trubshaw and his second wife Elizabeth (née Webb), at the Mount near Colwichin Staffordshire, the second son in a family of seven sons and two daughters.He was educated in Rugeley, but left school aged only eleven to start work in his father’s business.His earliest experience included working on buildings such as Sandon Hall, Fonthill Abbey, Buckingham Palace and Windsor Castle. In 1795, he worked on Wolseley Bridge near Colwich, and many of his early projects were bridges. On the death of his father in 1808, Trubshaw started a building business in Stone; an early commission was to build Ashcombe Hall.He worked for a time in partnership with the Lichfield architect Thomas Johnson (1794–1865), who was to become his son-in-law.In 1827, Trubshaw became a member of the Institution of Civil Engineers, and presented several papers there.He later became the chief engineer of the Trent and Mersey Canal Company, and superintended the construction of reservoirs, feeders and railways for the company. He also constructed many other bridges, including Exeter Bridge over the Derwentin Derby, Derbyshire (1850; now demolished). This is the earliest documented application of the technique of underexcavation,which has since been successfully used to stabilise the Metropolitan Cathedral of Mexico City(1993–98)and the Leaning Tower of Pisa(1999–2001).Trubshaw’s work accords with modern conservation principles as it was invisible, used the minimum intervention required and could be reversed or repeated if necessary. Despite the extreme instability of the ground, the straightened tower of St Chad’s stood without further intervention for over 150 years; it was restabilised using reinforced concrete foundations in 1989. Trubshaw’s other works include a column commemorating the landing of George IVat Ramsgate, Kent (1821),Ilam Hall, Staffordshire, near Ashbourne(1821–26),Weston House, Warwickshire(now demolished)and the orangery and lodges of Heath House, Checkley, Staffordshire (1830–1). He designed several Commissioners’ Churches, including St James’ Church, Stoke-on-Trent, Staffordshire (1833–34), St James’ Church, Congleton, Cheshire (1847–48)and Holy Trinity, Hanley, Staffordshire(1848–49).He also rebuilt St Michael’s Church, Great Wolford, Warwickshireand St Lawrence’s Church, Chorlton, Staffordshire. So that just covers some of the work of just two members of the Trubshaw family, what do we know about the rest of the family? Touch of synchronicity just reading Phil Drabble’s ‘A Voice in the Wilderness’ chapter entitled ‘The Big House’ which is about Hilton Hall and the Vernon Family and your message comes through Staffordshire Hilton. Quite amazing and all very interesting. You could drive yourself potty tracing a family like the Trubshaws, I think I will leave it to Andy Dennis! Take March of 1930 when Miss Trubshaw of Little Haywood was celebrating her 92nd birthday. Her father was Thomas Trubshaw, and grandfather James born in 1777, Thomas was the designer and builder of Great Haywood, Salt and Brererton Churches. The family had been associated with the village since 1495. Been all over the house from the kitchens to the attics when the the had a shuting down sale.